Etsy is an online marketplace where hundreds of thousands of creative people from more than 150 countries sell their handmade crafty goodness. Each week, we’re featuring a handful of our favorite items in our Etsy Roundup. On the menu this week: retro kitchen decor. If you want to make your kitchen super-cool with old-school pieces, you could scour the shelves of your local thrift stores — or you could do some major shopping on Etsy. A gold mine of retro kitchen items (in addition to retro for every room), Etsy offers easy online shopping for vintage items. We found four fun pieces of retro kitchen decor, most of them functional. Oh, how we love Etsy! Red is a popular color for kitchenware, but you don’t have to purchase brand-new items to make your kitchen red-hot. 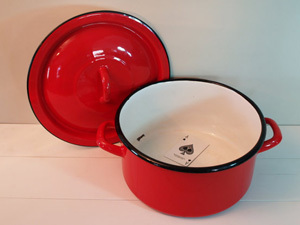 Go retro with this red enamelware lidded pot from Etsy seller Aces Finds (find them on Twitter and Facebook). Dating back to the 1940s, this pot is in great condition, save for a little wear that only adds to its vintage charm. It makes for a great piece of shelf decor or even storage. Tangerine Tango may be the 2012 color of the year, but orange was hot in the 1970s, too. Etsy seller Feed Your Soul (find her on Twitter and Facebook) offers this vintage fondue set in a bright orange color that will breathe life into any kitchen. 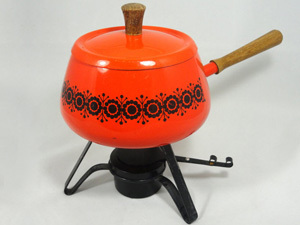 This retro kitchen item is in great condition and includes the orange fondue pot with wooden handle, lid, burner stand and snuffer. St. Patrick’s Day might be over, but the spirit of the holiday will live on until next March with this super-cool old-school set of green serving trays. Another find from Etsy seller Feed Your Soul (find her on Twitter and Facebook), these trays are in great vintage condition, with no nicks or cracks, meaning you can use them for decoration and serving. Hello, yellow! 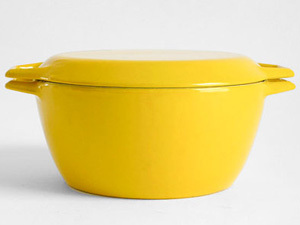 Etsy seller Hindsvik Shop (find the duo behind the shop on Twitter and Facebook, as well as on their design blog) offers this bright yellow Michael Lax Copco pot. 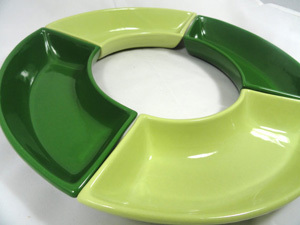 A midcentury classic, this retro piece will add a pop of color to your kitchen.